Samsung Galaxy S II 4G is the latest row Android smartphone released by Samsung. This time, Samsung offers a remarkable enabled smartphones android. 4G frill behind its name offering 3G HSDPA data access up to 21Mbps. Android operating system using OS 2.3 or Gingerbread and screen AMOELEDPlus Super-sized 4.3-inch capacitive touchscreen (480x800 px). 8 MP camera and Wifi is embedded along with GPS and FM radio. 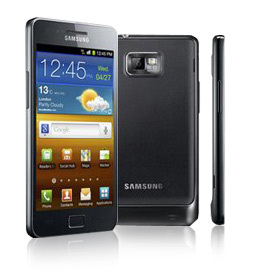 Do not miss Samsung Galaxy S II 4G use processor 1.2 GHz dual-core and 1700 mAh LiIon batteries. Samsung Galaxy S II 4G will be circulated in August at Virgin Mobile and Bell network in Canada, please get ready to welcome the newest gadget from Samsung.